Odds still seem good for a Trump tariff deadline extension -- Market hopes that the U.S. and China might somehow pull off a trade deal before March 1 were largely dashed on Thursday after President Trump said he would not meet with Chinese President Xi before the March 1 deadline. Mr. Trump had been optimistic about an end-Feb summit as recently as last week. That led to speculation that the U.S. and China were essentially planning a victory summit for late February where Presidents Trump and Xi could announce an agreement. 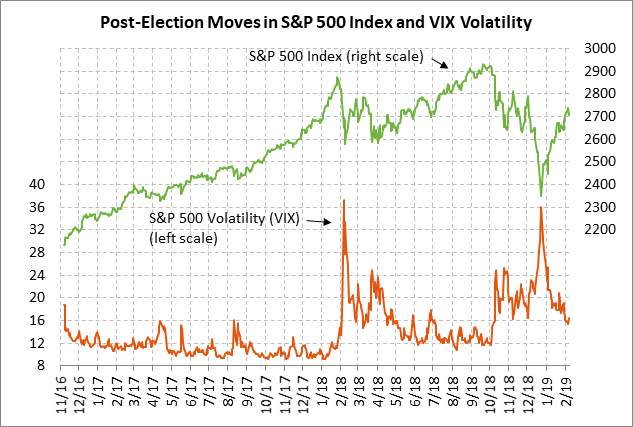 The markets were skeptical all along about whether the two sides would reach an agreement before the March 1 agreement. Nevertheless, Thursday's news of no Trump-Xi summit was disappointing and caused a sell-off in stocks that resulted in the S&P 500 index closing the day down -0.94%. The markets are now debating whether President Trump will extend the March 1 deadline or instead go ahead and raise tariffs to 25% from 10% on $200 billion on Chinese goods after the March 1 deadline. That decision may turn on the outcome of next week's US/Chinese talks when USTR Lighthizer and Treasury Secretary Mnuchin travel to China on Monday. Mr. Trump may well go ahead with the tariff hike if he thinks that China needs another big jolt to force them into concessions on the difficult structural issues such as IP and industrial policies. 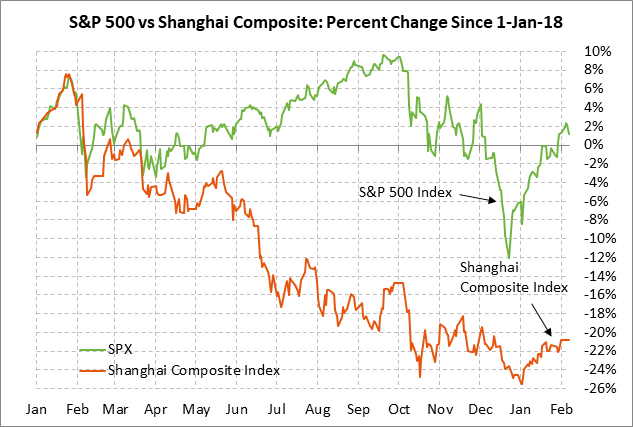 Yet Mr. Trump has recently become more aware of how much the US/Chinese trade talks are affecting the U.S. stock market and he may be reluctant to take any action that could cause stocks to again fall sharply and plumb the depths reached in December. Our view is that there is a better than 50-50 chance that Mr. Trump will extend the tariff-hike deadline beyond March 1 and allow negotiations to continue. There is a chance that if Mr. Trump raises the tariffs on March 1, China might simply walk away from the talks as they did last May. In that case, a thaw could take until later this year for talks to resume. By late this year, China will have more of an incentive to stall than to give concessions since the polls are not favorable at present for Mr. Trump to win a second term in next November's election. The reality is that time is running out for Mr. Trump to get a deal with China before the end of his first term. In our view, Mr. Trump would be well advised to take as much as he can get in the current round of talks and declare victory. If he raises tariffs on March 1, he risks causing further instability in the global economy and a sharp sell-off in stocks. 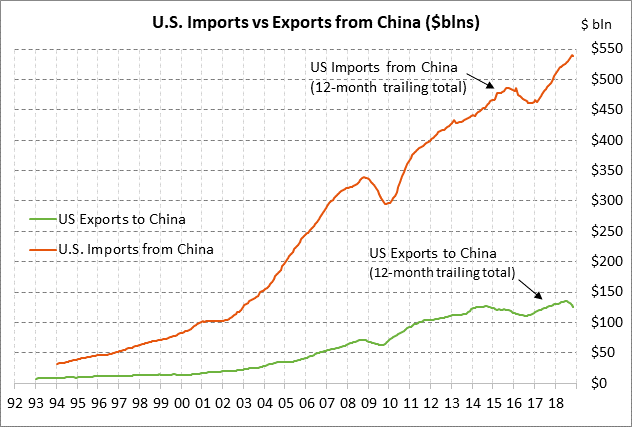 By contrast, if Mr. Trump wants to have a strong stock market next year during his reelection campaign, then the smart thing to do would be to wrap up a US/Chinese trade deal within the next few months. A US/Chinese trade deal by spring or summer could then help the Chinese and global economy to rebound into next year, providing a more buoyant stock market during Mr. Trump's reelection campaign. Congressional border security deal goes down to the wire -- Congressional negotiators tasked with finding a bipartisan border security deal expressed some optimism about reaching a deal by Monday. That would leave time for the House to write the legislation and put the border deal and a spending bill on the docket before the continuing resolution (CR) expires next Friday (Feb 15). The odds for a Congressional border security deal seem good since neither the Democrats nor Republicans want another shutdown and they need something to break the logjam and present to Mr. Trump. However, the big question is whether Mr. Trump would accept any small Congressional border security deal that falls far short of his demand for $5.7 billion in wall funding and that at most provides for a small amount of new border fencing or "infrastructure." If Mr. Trump does accept a Congressional border security deal, then the markets would be happily rid of the wall funding issue at least through the end of the fiscal year this September. If not, then Mr. Trump will have to decide whether to shut down the government again next Friday, or let the government stay open with a new spending bill and instead go ahead with declaring a national emergency. Alternatively, everyone could punt and pass another temporary CR to allow more time to hash over a border security compromise. The markets will be happy as long as the government stays open and there are no new economic disruptions. Prime Minister May faces a Brexit vote next week -- In line with all predictions, UK Prime Minister May on her visit to Brussels on Thursday received another resounding "no" regarding any EU concessions on the Irish border backstop, although the two sides did at least put negotiating teams back to work to see if they could pull anything out of a hat in the next few weeks. Ms. May is destined to head to Parliament next week with no EU concessions to overcome the massive defeat that her Brexit separation plan received in Parliament last Tuesday. Ms. May has promised Parliament a new Brexit vote next Thursday (Feb 14) if she cannot produce a revised Brexit deal with "alternative measures" for the Irish backstop. That Feb 13 deadline is self-imposed and could slip. Yet, when the vote occurs, the result will be highly uncertain given that time is short and options are dwindling. The most likely outcome seems to be simply a delay of the March 29 Brexit deadline. 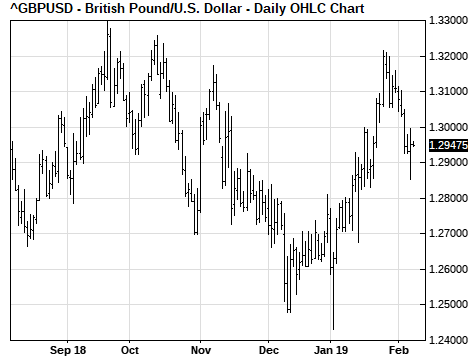 However, the betting odds are still as high as 33% for the disaster of a no-deal Brexit by April 1, according to oddschecker.com.